It's no secret that I'm an 80s girl! The 1980s were the years of big hair, super synthesized dance music and salad bars. My question is where have all the salad bars gone? Every restaurant used to boast a 'twenty foot salad bar' and stocked with everything from caesar salad and cold shrimp to chick peas, chopped eggs and bean medley. They were an 'all you can eat' affair or part of a combo with your main meal. Now they, along with my Rainbow jeans and glitter eye shadow, are gone. 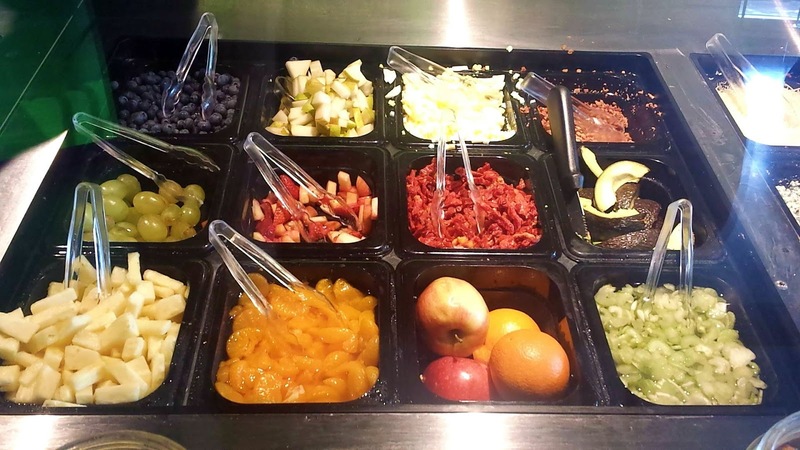 Most of the above mentioned items will never make a comeback, and some of you may say that this is for the best, but why can't the salad bar come out of retirement? That is what I would like to know. I hear the Bay City Rollers are doing it, and I'm not sure that is ever going to be a good idea, but large selections fresh healthy food is always a good thing. Right? Yes, there are some remnants of the good old salad bar days around. I can think of the Market Buffet and the Mandarin, and I'm sure you can tell me where to find a few more in the area. 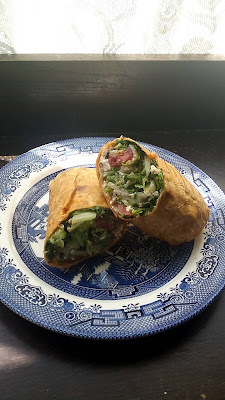 Just this week, I tried out something new in my own neighbourhood that makes me feel hopeful for the future of salad as a food item that can be both good for you and good to your taste buds. 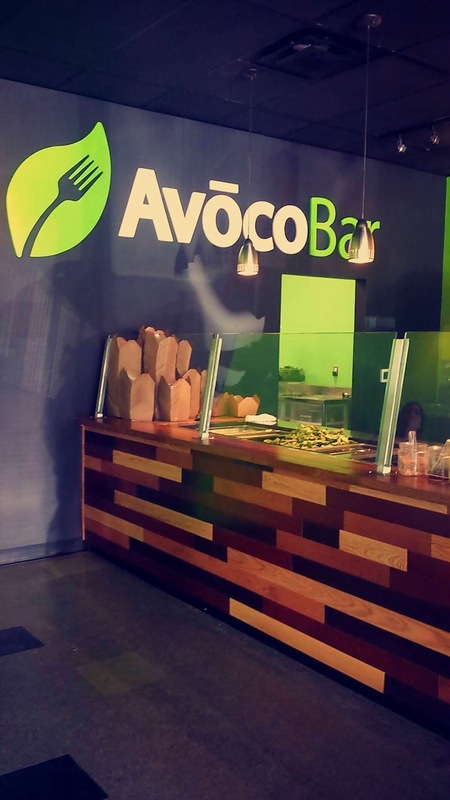 Have you heard of the AvocoBar? It sounds a bit like a happening night club, but it's actually a neat little lunch spot on the edge of my Tall Trees neighbourhood, mere steps away from the Bayfield St. strip, on Cundles Rd. E. In a small plaza that includes a beauty school and a clinic, a convenience store recently vacated and the AvocoBar moved into the empty corner shop. A sandwich board outside proclaims that healthy fast food is sold within. My daughter and I spent a rather long morning in the Drive Test office on Friday, which I'm sure is no surprise to anyone. She got her G1 license (hooray!) and, by the end of that excruciating government process, we were both very hungry, and short on time. 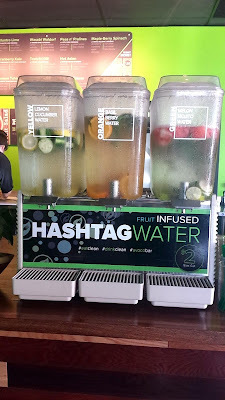 "Have you been in the AvocoBar yet?" she casually asks. "No. but let's go there right now." I reply. Well played, Miss Margaret, well played. 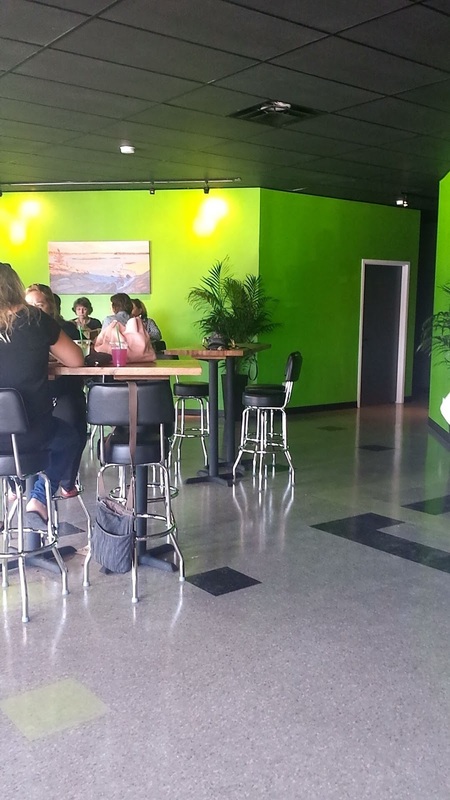 The interior of the AvocoBar eatery is much bigger than I imagined. There are lots of high tables and tall chairs for those patrons dining in, many of them occupied on this sunny Friday lunch hour. 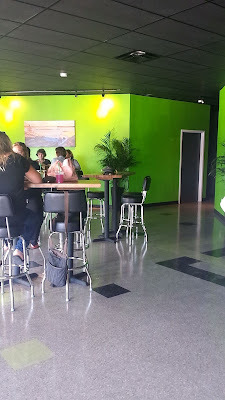 The walls are painted fittingly bright green with chic black accents. The decor is simple and clean - much like the food, I guess. I always feel like somewhat of a dummy when I approach the counter of some new (to me) restaurant with a unique ordering system. Everybody else always seems to know what they're doing, don't you think? So I slide up to the salad bar with a big L on my forehead and confess my newbie-ness straight away. The young lady behind the counter was awesome. She tells me that she is there to help. Hallelujah! My anxiety melts away. Step 1: Pick your base, which is a selection of lettuces or greens. Done. Step 2 Choose up to 4 toppings from a huge selection. Step 3. Pick one of 20 house made dressings. The combinations are absolutely endless, when you think about it. 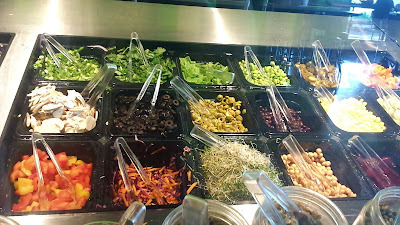 Also, there are special 'designer' salads to chose from that have the ingredients already picked out for you. This is a blessing for someone like me who may be feeling a little overwhelmed by the multitude of ingredients available. I know I love Greek salad so I picked that and added falafel. The other neat thing is that you can chose to turn your salad into a wrap for only .25 more. That's right - a quarter! Where else can you get an upgrade for anything today for a quarter? I got the tomato basil wrap for my salad. Margaret ordered a beet salad with chicken. What a cool system they have for mixing the salads. 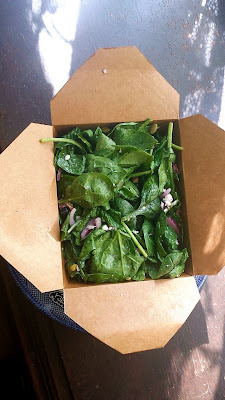 Each salad is mixed inside a bag and shaken to mix, then popped into a cute little cardboard container reminiscent of a gift box. They write your name on it a la Starbucks and off you go. 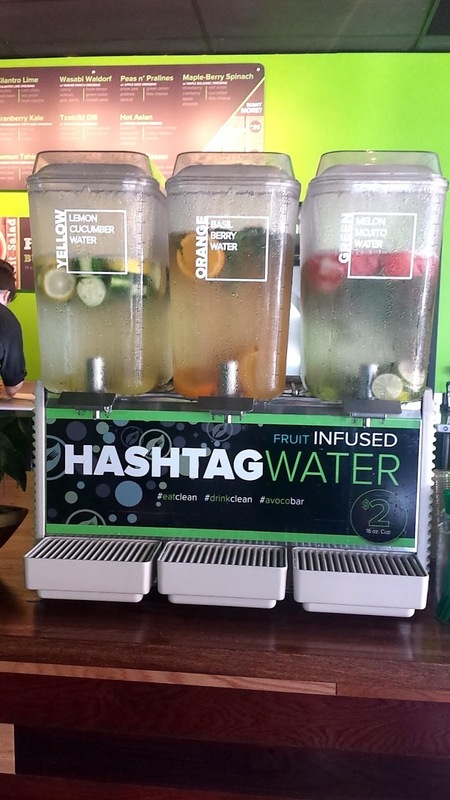 If you are thirsty, there are beautiful drink dispensers bubbling away with ice cold water infused with things like lemon, mint and cucumber. This is definitely guilt free fast food. There are fruit salads available too, and vegan chili as well as butternut squash soup, things that I must try. How nice that it is a short walk from my house. 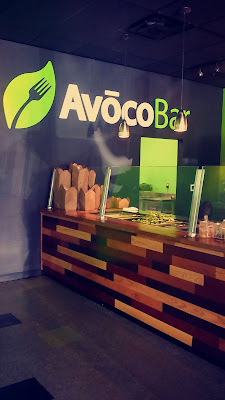 Welcome to the neighbourhood, AvocoBar. I think we are going to get along very well.